We created this infographic to highlight important facts about e-signatures and to underline their benefits for all businesses. 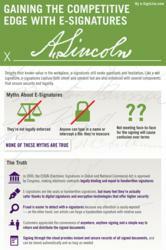 e-SignLive™ and Silanis, long-time industry leader in e-signature technology, today launched a powerful new infographic that dispels e-signature myths with compelling information and statistics compiled from its client database. e-SignLive’s infographic also addresses the legality of e-signatures and presents their key competitive advantages. Data from both Silanis and e-SignLive clients confirms that using e-signatures saves millions in costs, ramps up sales, improves customer service and helps protect the environment. The e-SignLive infographic provides e-signature statistics relevant to a wide range of business models and sectors. The U.S. Army, which uses Silanis’ enterprise e-signature solutions for processes that range from munitions requests to new hires, has realized estimated annual savings of $1.3 billion. Similarly, one of the top 10 banks in the United States has seen document handling expenses cut by 80 per cent and processing errors reduced by a staggering 90 per cent. Smaller businesses are also realizing significant benefits from using e-signatures. By using e-SignLive, Signature Mortgage, an independent mortgage lender in Ohio, cut its shipping costs by 85 per cent while increasing its loan volume by 35 per cent. As a result, it was able to successfully compete with much larger institutions. Outside of their clear productivity benefits, e-signatures encourage a truly paperless office that is as good for the environment as it is for the bottom-line. Because e-SignLive users can sign online from anywhere at anytime, travel is less necessary and so businesses can curb their contribution to carbon emissions. As well, less paper is printed and more trees are saved. As e-Signlive’s new infographic points out, paper and paperboard counted for 34 per cent of solid waste in the US in 2005 and only 50 per cent of it was recycled. In 2000, the ESIGN (Electronic Signatures in Global and National Commerce Act) was approved by Congress, making electronic contracts legally binding and equal to handwritten signatures. Many feel that e-signatures are actually safer than handwritten signatures because each action in the electronic signing process is recorded and traceable. In contrast, forgers can duplicate wet signatures with relative ease.